Village crews will be picking up leaf piles raked to the curb every Friday from April 12th until May 10th. As the fiscal year for the Village of Spencerport is fast approaching at the end of May, I wanted to take this opportunity to thank the residents of the Village of Spencerport for enduring another winter and the welcoming of spring and summer. Because of the early onset of winter Village Crews will be going around the Village picking up leaves that are raked to the curb every Friday until May 10th with the leaf machine. For all other yard debris please check the Village website for directions on disposal or call the Village Office. I would like to also acknowledge the entire staff of the Village of Spencerport for their hard work throughout the entire year. Each department equally plays a role in the outstanding services that the residents have grown to expect and appreciate. The Department of Public Works completed many projects throughout the year including paving and crack sealing various roads throughout the Village; sidewalk replacement on S. Union Street; continued sanitary sewer maintenance and slip lining and the replacement of various pieces of equipment. Crews went out for 47 salt runs using 320 tons of salt and 26 plow runs. Spencerport Municipal Electric continues to upgrade the electric system to provide uninterrupted power to its customers. Additionally, SME crews provided mutual aid to neighboring communities throughout the state to restore power to their areas during their storm events. The Village of Spencerport Board of Trustees adopted the 2019/2020 Budget effective June 1, 2019. During the upcoming fiscal year residents will see a reduction in their tax bills as in 2018 with no reduction in services. This is a $33.00 reduction in the tax bill from the previous year on a home valued at $100,000 using 47,000 gallons of water. This was possible because of the increase in the assessed value of Village properties, the use of unreserved, reserved fund balances and grants for the purchases of equipment and completion of projects. Road work will be done on Bauers Cove and Bowery Street. Micropaving on various roads and new sidewalks will be installed between the Canal Bridge and Texas BBQ Joint. These projects as well as many others including free Sunday Summer Concerts along the canal will continue while keeping the Village annual budget below the 2% tax cap. Finally, the Union Street Bridge over the Erie Canal will be closed starting in July 2019 and will be closed for the next 12-18 months. The work will include floor system repairs, lower course of the truss; lifting mechanisms, pit walls and the approaches. In addition, the two parking spaces on the south west side of Union Street will be removed to allow for a better approach for vehicles traveling northbound over the bridge. I have been working closely with the NYS DOT and Village businesses to ensure that the impact of this closure is as palatable as possible. I am aware that this will be an inconvenience to everyone at first, but I am confident that the residents, merchants and visitors will get through this project as they have with many others no worse for wear and we will have a new and safer bridge. In closing, these projects would be impossible without the cooperation of the entire Village. With these projects temporary road closures and electric outages are necessary. I assure you that we will make every attempt to keep any inconveniences at a minimum and appreciate everyone’s cooperation. The New York State Department of Transportation today announced that the bridge carrying Route 259 (Union Street) over the Erie Canal in the village of Spencerport, Monroe County will temporarily close next Wednesday November 7th, through Friday November 9th, 2018 for repairs. NYSDOT bridge maintenance crews will be performing repairs to the deck system to strengthen the bridge ahead of the winter months. During the repairs, a detour will be in place for motorists to use Route 31, Manitou Road and Route 104 (W. Ridge Road). Following the Union Street closure, the nearby Martha Street Bridge over the Erie Canal in Spencerport will close throughout the winter for repairs and will re-open early next Spring. The work being done on both bridges is to prepare for and ensure the success of NYSDOT’s upcoming Liftbridge Rehabilitation Project, which will see the Route 259 liftbridge close next July for approximately 13 months. Significant rehabilitation work to take place will extend the service life of the bridge for the next 40 to 50 years. For real-time travel information, motorists should call 511 or visit www.511NY.org or the mobile site at m.511ny.org, New York State’s official traffic and travel information source. Follow New York State DOT on Twitter at @NYSDOT and @NYSDOTRochester. Find us on Facebook at facebook.com/NYSDOT. November 2018 – With the falling of the leaves in the Village of Spencerport and the close of this beautiful summer season, I wanted to take this opportunity to update the residents on the happenings around the Village of Spencerport. I would be remis if I did not acknowledge the entire staff of the Village of Spencerport for their hard work throughout the entire year. Each department equally plays a role in the outstanding services that the residents have grown to expect and appreciate. The Department of Public Works again completed many projects this summer including the construction of new sidewalks on Union Street from East Avenue north to the Texas BBQ Joint driveway and on Amity Street. Various streets were treated with either paving or crack sealing. New steps located in the Village Plaza leading to the Heritage Trail were installed as well. Spencerport Municipal Electric continues to upgrade the electric system to provide uninterrupted power to its customers. Additionally, SME crews provided mutual aid to neighboring communities throughout the state to restore power to their areas during their storm events. The Village Office administered the LED light bulb give away during the month of October and continues to assist the residents with all their needs. Village of Spencerport Board of Trustees has been working with CSX for the removal of the bridge abutments located on Union Street. This project will be commencing soon, and the contractor will do their utmost best to provide safe laneways on Union Street during the project. Last but not least let’s cross some bridges…as I write this update I have been informed that the Martha Street Bridge will be closed for repairs for three (3) months possibly starting as soon as next month to bring the weight restriction up from 12 tons to 22 tons to prepare for the July 2019 closing of the Union Street bridge for 18 months. The Union Street bridge is scheduled to close to all traffic in July of 2019 for repairs of the decking and lift mechanisms. The Martha Street bridge will be open to all traffic. The 2018 repairs to the Martha Street bridge will raise the weight restriction to 22 tons, signal lights will be moved out to Canal Road to allow for safer cuing to travel south on the bridge and steel solid decking will be installed on the west side of the bridge for pedestrians and pets. I know that these projects cause a change in our daily routines and I am asking all of you to please have patience with the workers and each other during this time. I assure you that everyone is doing their best to keeps these inconveniences at a minimum. In closing, these projects would be impossible without the cooperation of the entire Village. Individuals, Families, Community Groups and Businesses can now buy a bench to replace an existing village bench or have it placed in the new location. All benches include an engravable plaque. Please use the attached form to place your order. July 23, 2018 - It has been brought to my attention that a Giant Hogweed has been identified along Northrup Creek off of Webster Road. Please be aware of this plant and if it is found call the NYS DEC immediately. 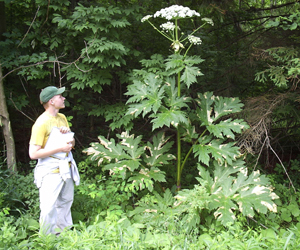 Below is information about the Giant Hogweed and a link to the NYS DEC website. Giant Hogweed - Do Not Touch This Plant! "With Reverence for our Past & an Eye to the Future"
Welcome to the Village of Spencerport, New York! 3) Retention of established business in our Village. All serve needs of residents and create destinations for tourists and visitors.